For all their convenience, window blinds can be kind of a pain sometimes. Who hasn’t pulled too hard on one side of the cord, ending up with a lopsided effect? Or maybe you’ve wondered how to clean dusty blinds without taking it slat by slat? Or worse, worried that an adventurous child or pet might get themselves tangled in the cord? Thankfully, windows manufacturers have finally gotten wise to all these problems and designed windows with built-in blinds. In these windows, the blinds sit positioned between two panes of glass, rather than as a separate treatment over the frame. You operate the blinds using a remote control, or via a magnetic slider that runs along the side. Still, having the blinds inside the glass changes the look and behavior of your window treatments and, potentially, the energy efficiency of your whole window. While some people find them much more convenient, they’re not for everyone. Here are some of the pros and cons so you can decide for yourself if integral blind window replacement is right for your home. Reduced maintenance: Manufacturers claim that having the blinds inside the glass virtually eliminates the need to dust or clean them (although in reality, some homeowners report that they have to clean them every couple of years). Well-sealed windows don’t accumulate dust and other allergens the way traditional window treatments do. That makes them a huge plus for many homeowners, since cleaning blinds thoroughly can be a tedious job. Less risk of breakage: Having the blinds behind the glass protects them from damage and routine wear and tear. Blinds frequently become brittle and break over time, particularly if you have less expensive vinyl treatments installed on your windows. But even higher quality products aren’t safe from pets or young children who may bend or break the slats. Because of this, most homeowners find themselves replacing the blinds frequently, probably once every four years or so. No so with integral blinds. Although internal blinds certainly aren’t invulnerable to damage, they may potentially last as long as the windows themselves. Many even come with a ten or twenty-year warranty. Safer for families with young children: The benefits of integral blinds extend beyond mere aesthetics, particularly if you have toddler-aged kids in the house. The cords on traditional blinds pose a risk of strangulation to young children—the watch group Parents for Window Blind Safety reports almost 600 cases of cord-related incidents in the past 30 years. Since they’re absolutely cordless, integral blinds skirt this risk altogether, offering parents huge peace of mind. Convenience: Blinds can be difficult to operate. But the magnetized slider simplifies the whole process. Or, if you go with a motorized version, you can avoid the hassle of manual operation altogether. And integral blinds make a great choice for large glass doors, since they won’t swing and get in the way of the door’s movement. Increased price: Purchasing a new window with built-in blinds obviously costs more than a set of blinds. And manufacturers typically classify windows with integral blinds as specialty products, meaning you’ll have to spend more than traditional models.For the Design Series from Pella, for instance, expect to spend around $500 to $600 per window. However, home improvement stores offer a select variety of less expensive models, although even these will run you more than traditional products. 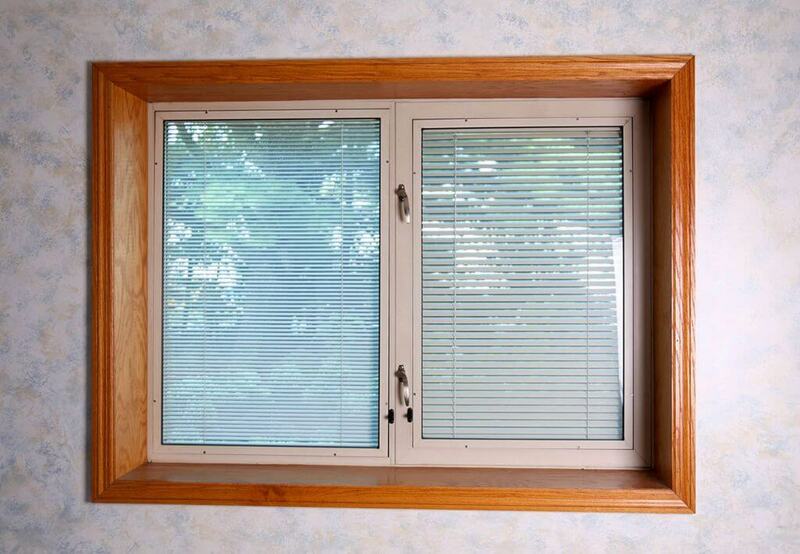 A sliding glass door with integral blinds from Home Depot, for instance, costs almost $1,000. That’s about half the price of a normal patio door. However, when you factor in the cost of blinds, the price becomes much more competitive, since certain types cost anywhere from $150 to $300.Another cost to take into consideration is the price to replace the blinds. The glass does protect internal blinds, but that doesn’t mean they can’t become damaged. And installation costs start at $118 minimum—for that price, you can practically purchase a new window. Limited design options: Speaking of selection, that’s another limitation you may face if you choose to go with internal blinds. While traditional blinds come in almost any material you can think of, from bamboo to aluminum to pine, your choices may become much more limited if you decide to purchase internal blinds. Also, due to the slider, you won’t find them in a variety of styles, either, such as Venetian or roller blinds. While many have a stately, elegant appeal (Pella and Andersen, for instance, both offer a nice range of colors and styles), they don’t make the best choice for a really unique or unusual window treatment. Decreased energy efficiency: Manufacturers will usually insulate windows with argon, which they seal between double pane windows to slow drafts. However, they may forego this insulation in models that include integral blinds in order to maintain the integrity of the window treatments. And that can lower the window’s U-factor, the measure of its insulation. To avoid this issue, look for triple pane window models, ensuring that the window has a separate layer of insulated glass. Overall, if you need new windows anyway and struggle with traditional window treatments, new window replacements might be a great solution. Integral blinds definitely make opening and closing the windows easier. And who couldn’t use a little less hassle in their life?